FAIRBANKS, Alaska — Two weather balloons rose into the frigid Alaska air early Thursday (April 12), on a quest to photograph and study the dazzling northern lights display that danced around them. A group of scientists had been launching such instrument-laden balloons for the past week or so from a variety of locations near Fairbanks. The auroras had proved somewhat elusive, but they were bold and bright in Thursday's wee hours above the summit of Murphy Dome mountain, and the researchers' excitement was palpable. "This is really only our second launch with really bright auroras," said Ben Longmier, a physicist at the University of Houston and chief research scientist at the Ad Astra Rocket Co., as he and his team prepped the first balloon around 1 a.m. local time (5 a.m. EDT). "We've been testing this technology all week, and now it's game time." The team sent weather balloons to the aurora's edge, about 19 miles (30 kilometers) above Earth's surface. The balloons carried high-definition cameras to record video and stills of the northern lights, which result when charged particles from the sun collide with molecules high up in Earth's atmosphere, generating a glow. The project, which lofted a total of 22 balloons before wrapping things up on Friday (April 13), also got a lot of footage from the ground. And it had hoped to complement these shots with images of the Alaska aurora captured by NASA astronaut Don Pettit, who is currently zipping around the planet at an altitude of 240 miles (386 km) aboard the International Space Station. "Haven't heard from Don; I suspect he became busy with all of the SpaceX docking procedures and tasks coming up soon," Longmier told SPACE.com via email today (April 16), referring to the April 30 flight of SpaceX's Dragon capsule to the space station. " We plan to pore through the ISS photos from Don's increment once they are uploaded to the NASA servers." In addition to the cameras, the balloons carried a variety of instruments and experiments, including microphones to capture the sound of the aurora and bacteria samples to investigate the DNA-damaging potential of fast-moving cosmic rays. Many of these payloads were designed or suggested by students, some of them grad students, some undergrads and some middle schoolers. And that plays into another goal of Project Aether: Aurora — getting kids more excited about science, technology, engineering and math. The photos and video may help in that respect. The researchers are working with GoPro, which provided the high-definition cameras, to get the footage out to the public. And the expedition's adventures — which include chasing down fallen balloon payloads using helicopters and snowmobiles — could help convince kids that science can be fun, Longmier said. While Project Aether: Aurora is working with just a handful of schools right now, it has big dreams. It wants to take low-cost balloon launches to every American classroom, so kids can experience the excitement of science firsthand. "What we're really trying to do here is change the culture of every middle school in the country," said team member Edgar Bering, a physics professor at the University of Houston. "We want to make it cool to be a geek. And guess what? We're going to do it." After sending the second balloon toward the heavens a little before 2 a.m. local time on Thursday, the expedition team gathered under the flickering green northern lights and let out a huge cheer. It was a celebration of the bright and beautiful aurora, perhaps, and the fact that the two balloons were streaking up toward the shimmering lights to take a closer look. There may have been some relief in that yell as well, and a strong sense of satisfaction that a lot of hard work had apparently paid off. 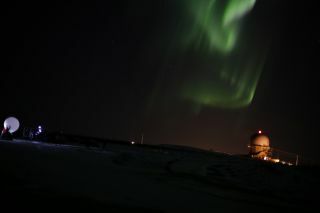 "The aurora is still going on," Bering told SPACE.com shortly after the second balloon ascended out of sight. "I think these are going to be very successful flights." The researchers won't know for sure until they track down the balloon payloads, wherever they may land, and inspect the footage and instruments. But that's all part of the project, and part of the fun.